I thought we knew a lot about LEGO. In the past several weeks, however, I've discovered we've just scratched the surface with all of the goodness LEGO Education has to offer. When the Simple and Motorized Mechanisms set was delivered to our house, I had Grant open the box, organize the pieces and look through the instruction books. Since it was at a middle school level, I told him to wait for a bit until I could help him - or until I could get one of our middle school boy LEGO lovers to come over and assist. Finally, I caved in and just let Grant HAVE AT IT. He has been building something different every day - and learning SO MUCH in the process. While the set is designed for classrooms at the middle grades level, it has been SO applicable to our homeschool. You can click over and see the specifics of the set for yourself. In my opinion (for what it's worth), I would rather have one of these large education sets than several of the themed LEGO sets. The creativity and learning is exponential. I love that Grant is experimenting with size of wheels and how they affect speed (we talked about surface area). He is learning about motors and gears. He is learning how to work with more detailed instructions. He is talking about bushings, and showing me exactly what makes the wheels turn in a motorized creation. This is a great tool for my math and engineering minded little guy. We created several Vine videos to show you his creations. He loves to make something and then do a Vine to go with it. *You may need to mouse over the videos for them to begin playing. If you don't have sound, in the upper left corner of the video is a speaker you can click. Don't you love on this last video how he says, "Non Instruction Motor Controlled Car", so that we all know he made this model on his own? This tells me he has taken what he has learned and is APPLYING THAT KNOWLEDGE. Score. 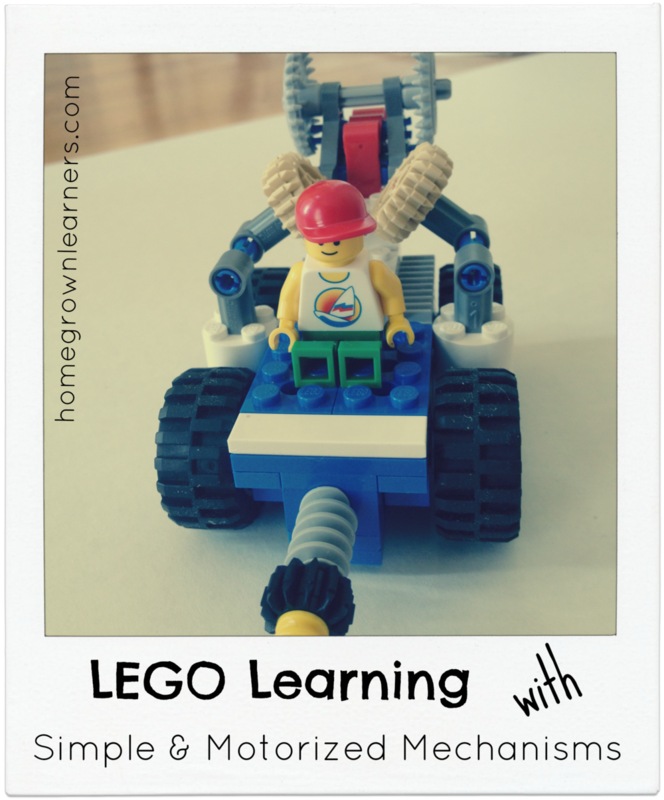 I'm proud to be a LEGO Education blogger. I want you to be aware of the many products they have that can benefit your homeschool. I might even be having a GREAT giveaway soon -- keep your eyes on the blog! *I received the Simple and Motorized Mechanisms set in exchange for my honest review. No other compensation was received.